ABSTRACT – Ground-dwelling spiders were sampled at 304 quadrats in 24 survey areas chosen to represent the geographical extent and diversity of terrestrial environments in the Pilbara region of Western Australia, an area of approximately 179,000 km2. Only taxa that were primarily ground-dwelling and were taxonomically robust were identifi ed to species level. A total of 375 species comprising 14 families was recorded. The families Salticidae (93 species), Zodariidae (71 species) and Oonopidae (70 species) showed marked species-level radiation. After excluding quadrats that were burnt or flooded during the sampling period, the distribution data of 375 species from 294 quadrats were analysed, with an average of 12.9 (SD = 6.8) species per quadrat. 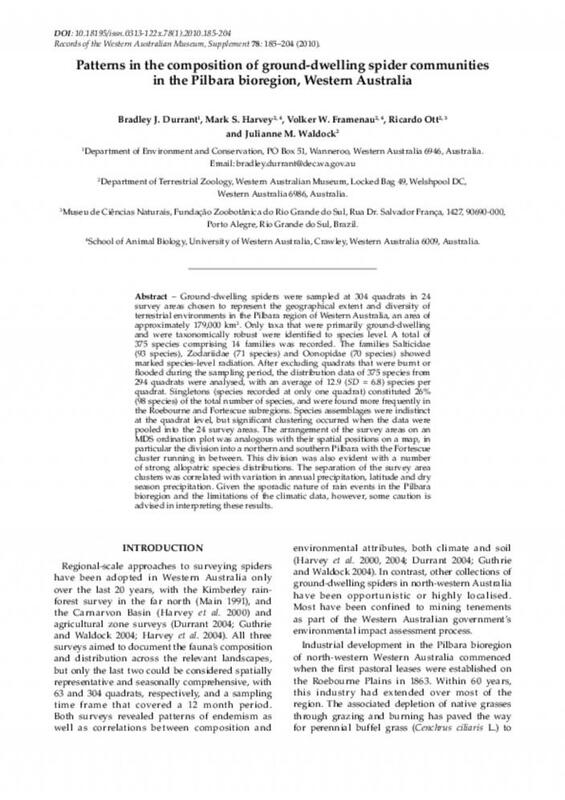 Singletons (species recorded at only one quadrat) constituted 26% (98 species) of the total number of species, and were found more frequently in the Roebourne and Fortescue subregions. Species assemblages were indistinct at the quadrat level, but signifi cant clustering occurred when the data were pooled into the 24 survey areas. The arrangement of the survey areas on an MDS ordination plot was analogous with their spatial positions on a map, in particular the division into a northern and southern Pilbara with the Fortescue cluster running in between. This division was also evident with a number of strong allopatric species distributions. The separation of the survey area clusters was correlated with variation in annual precipitation, latitude and dry season precipitation. Given the sporadic nature of rain events in the Pilbara bioregion and the limitations of the climatic data, however, some caution is advised in interpreting these results.